A fascinating paper just published in Science, examines the nutrients limiting the growth of the photosynthetic marine cyanobacterium, Prochlorococcus, in a much more interesting and comprehensive way than previously possible, and although it doesn’t directly speak to the feasibility of fertilizing the ocean to trap CO2 (sorry about the somewhat misleading title to this post) it greatly increases the potential sophistication with which such a goal could be pursued. The goal of the study by Saito et al. (2014) was to cruise across the equator from Hawaii south, measuring nutrient concentrations—nitrogen, phosphorous, iron, and other micronutrients such as cobalt—and analyzing the proteins in Prochlorococcus, to see if deficiencies in particular nutrients resulted in the production of specific proteins helping to deal in some way with the shortages; instead of looking at the bacterial genome, they were looking at the proteome. Sure enough, shortage of any particular nutrient resulted in production of one or more compensating proteins. One of their more interesting results was that, unlike what had previously been thought, the bacteria were doing more than just responding to the nutrient in lowest supply, the one biologists would call “limiting”. Instead they produced an array of such proteins, responding to various degrees of nutrient deficiency, perhaps responding to past swings in specific nutrient availability, or preparing for new ones, but also burdening themselves with the production of proteins that might not have been useful immediately. Climate change is expected to alter the oceanic distribution of nutrients, and with it, the distribution of photosynthetic plankton. 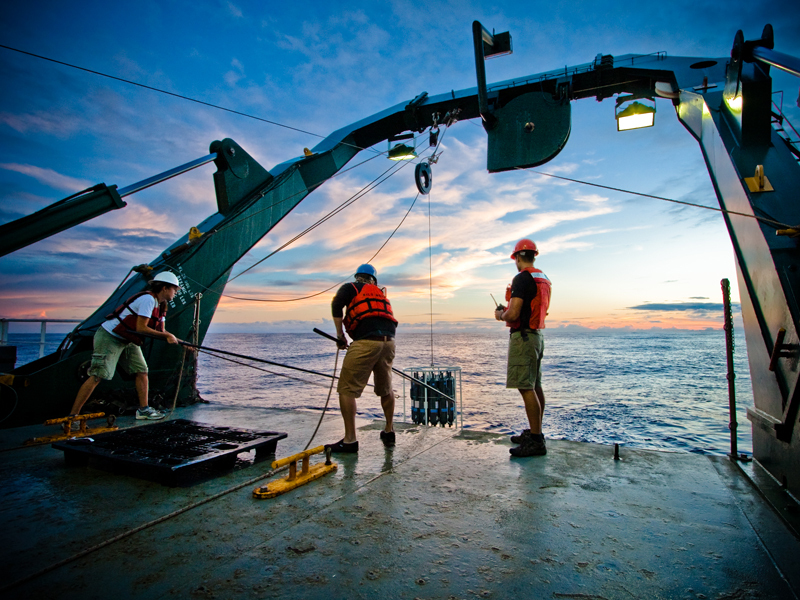 It may be that large-scale metaproteomic studies such as this will be an efficient way to trace these changes, and may also be useful in any future attempts to reverse climate change by encouraging phytoplankton growth in the open ocean. Constantine Alexander has a nice post about this study, and the photo above of the actual study in progress is a link to his site. This entry was posted in Emil Morhardt, Fertilizing Nature, Geoengineering, Ocean Fertilization and tagged Anton F. Post, Carl H. Lamborg, Climate change, College of Charleston, cyanobacteria, Dawn M. Moran, Giacomo R. DiTullio, Mak A. Saito, Marine nutrients, Matthew R. McIlvin, Prochlorococcus, proteomics, Tyler J. Goepfert, Woods Hole Oceanographic Institution by Emil Morhardt. Bookmark the permalink.